C.J. Anderson went off for 167 yards on 20 carries in Todd Gurley‘s absence. It often took more than one defender to bring the big back down, and his fresh legs were easily able to handle the heavy workload. 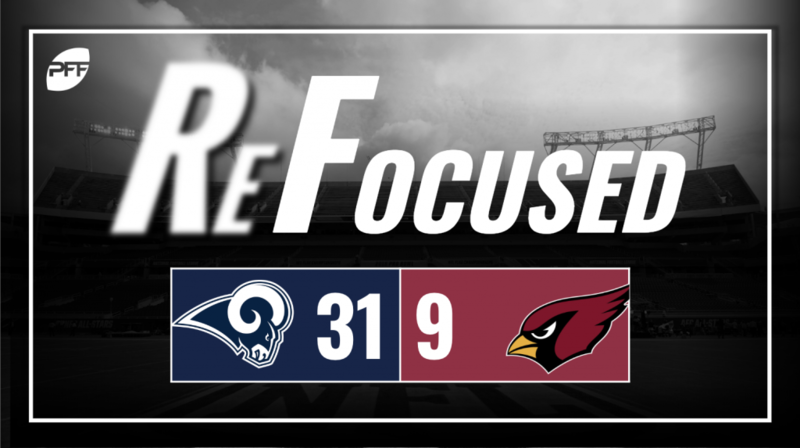 The Rams owned the line of scrimmage and ran for 269 yards on 41 carries. Jared Goff had a solid day, as the Rams’ play-action passing was in full effect after establishing a dominant ground attack. Goff finished with a 118.1 quarterback rating after going 19-of-24 for 216 yards. His favorite target was Robert Woods, who had six catches for 89 yards. Aaron Donald was his usual dominant self, as he notched three more sacks and a number of run stops. The Arizona line has had struggles throughout the season, and against the best defender in football, today was no exception. Ndamukong Suh was also a force, as he scored a cleanup sack to go with two passes batted down at the line of scrimmage. When the Rams get a lead like they did today, the pass-rushing duo of Suh and Donald make it next to impossible for teams to come back. There aren’t many positives to take away for a Cardinals’ defense. They allowed 461 yards and were unable to get off the field as LA converted 6/9 on third downs. Cornerback Brandon Williams struggled in coverage, surrendering a 39-yard touchdown to Robert Woods along with a 26-yard crossing route to Josh Reynolds. The Cardinals will look to address the cornerback spot opposite Patrick Peterson in the offseason, as they haven’t found a successful combination for some time. Josh Rosen started out well, as he was able to move the ball early by scrambling. However, his lack of time and lack of open targets downfield eventually caught up with him, and it was clear throughout the third quarter he was trying to gut it out at far less than 100 percent. Larry Fitzgerald had a nice outing in what could prove to be his final home game in Arizona should he choose to retire after the season. He was the only receiver able to create separation against the Rams’ defensive backs and threw a nice touchdown pass on a trick play in the first half. Anderson gave the Rams’ offense a nice boost after they came back to reality the past two weeks. The Rams will play next week for a first-round bye, and it’ll be interesting to see whether they rest Gurley considering Anderson’s performance. Donald was far too much to handle for the Arizona interior offensive line.